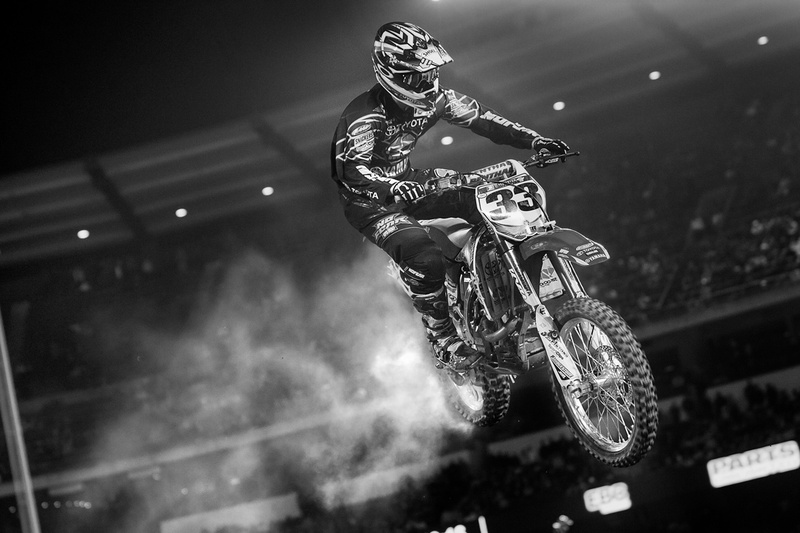 Considering the opening round of the Monster Energy AMA Supercross series is less than two days away in Anaheim, California, we thought we'd take a look back at the 2009 season opener. That year, the 450 Class was stacked, and the main event was nothing short of epic. After an early race battle between series favorites, Chad Reed and James Stewart, which ended in the two riders taking each other out in the whoops on lap seven, Josh Grant took over the lead and never looked back. With two laps remaining, though, Grant snagged a Tuff Block cover, sucking it into his rear wheel, and ultimately slowing him down. The cover caused him to lose his rear brake, but the Yamaha rider continued to push to the end. Even with the cover smoking in his wheel, Grant hit his lines—he even continued to jump a gnarly quad in a rhythm lane—and narrowly held onto the lead to take his first career 450 main event win. The smoke from the Tuff Block cover can be seen clearly in this photo of Josh Grant.